St. Lucia is situated in the heart of Zululand with a large amount of activities. Activities include the game reserves, the sea and the town center. Night drives, dayley excursions, hikes and horse back safaris are available in Hluhluwe Game Reserve and Cape Vidal. River boats provide the means for hippos and crocodiles to be viewed from close up. Shore and deep sea fishing trips are available and high on your agenda should be a whale watching trip and a night turtle drive (seasonal) – you are guaranteed to see both. The village center boasts an open fruit/craft market where you can barter with locals, restuarants/pubs, banks, internet cafes, medical doctor. The house consists of 4 bedrooms and 3 full bathrooms. 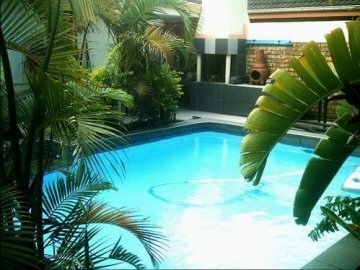 The house is fully air conditioned – the main bedroom is airconditioned, ceiling fan, en-suite with a queen bed, bedroom 2 has a queen bed with air-con and bedroom 3 two twin beds with air-con, bedroom 4 has queen bed with bunkbeds and en-suite bathroom, air-con.. The large open plan kitchen/lounge/dining area is airconditioned – the kitchen is fully fitted (microwave, fridge, seperate chest deepfreeze, etc.). It is serviced on a dailey basis, full DSTV, private pool and BBQ area and within walking distance to all shops and resturantes. Your pets are always welcome! !